Grant, we pray, almighty God, that the revered intercession of Saint Hedwig may bring us heavenly aid, just as her wonderful life is an example of humility for all. Through our Lord Jesus Christ, your Son, who lives and reigns with you in the unity of the Holy Spirit, one God, for ever and ever. Pour out on us, we pray, O Lord, the spirit with which you so remarkably endowed Saint Margaret Mary, so that we may come to know that love of Christ which surpasses all understanding and be utterly filled with your fullness. Through our Lord Jesus Christ, your Son, who lives and reigns with you in the unity of the Holy Spirit, one God, for ever and ever. 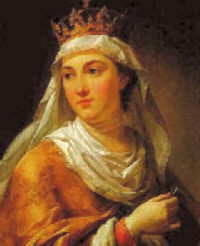 Hedwig (1174-1243), the aunt of St. Elizabeth of Hungary, was married at an early age to Henry, Duke of Silesia. After their six children had been born, they both strove to advance in sanctity and to enrich Silesia and Poland with monasteries, hospitals, and leper asylums. When Henry died in 1238, Hedwig took the habit of the Cistercian nuns at Trebnitz (where one of her daughters was the abbess), but retained the administration of her property so that she could give personal relief to the suffering. After a girlhood marked by painful illness and even more painful family discord, Margaret Mary Alacoque (1647-1690) entered the Visitation convent of Paray-le-Monial, France, at the age of 22. She was ignorant, sickly, and clumsy, but she had great charity and humility. Our Lord chose her to spread devotion to his Sacred Heart, at a time when rebellion without (Protestantism) and heresy within (Jansenism) were doing their best to separate Catholics from their faith and their God. Marguerite d'Youville is the first native Canadian to be elevated to sainthood. She founded the Sisters of Charity. According to the 1962 Missal of St. John XXIII the Extraordinary Form of the Roman Rite, the feast of St. Margaret Mary is celebrated on October 17. St. Gerard Majella, listed in the Roman Martyrology, was a native of Muro in southern Italy. He was apprenticed to a tailor before asking to be received by the Redemptorists as a lay-brother. He continued his trade in the monastery, where he soon attracted the attention of St. Alphonsus de Liguori, who shortened his novitiate. His wonderful and well authenticated life was a series of supernatural phenomena — bilocations, reading of consciences, prophecies, multiplying of food, etc. He was canonized in 1904 and is the patron of expectant mothers and unborn children. Hedwig was born in 1174 in Bavaria, the daughter of the Duke of Croatia. She was the maternal aunt of St. Elizabeth of Hungary. She married Duke Henry of Silesia and raised seven children, with the boys being quite a handful. She outlived all but one of her children, Gertrude. Hedwig persuaded her husband to use her dowry to found a Cisterian monastery for nuns at Trebnitz. Their daughter Gertrude later became abbess of the monastery. Patron: Bavaria; brides; duchesses; death of children; marital problems; Silesia; victims of jealousy; widows. Symbols: noble lady holding statue of Virgin and Child; noble lady holding a church (symbol of monastery); lady holding pair of shoes under arm. On this feast in Poland, there is a bread called Hedwigsohlen (Shoe Soles of St. Hedwig) that used to be distributed to the poor of Trebnitz on her feast day. The shoe soles remind us of her generosity to the poor, and the fact that she sacrificed her own comfortable shoes in walking to church. A recipe can be found in Cooking with the Saints by Ernest Schuegraf, but any recipe for a bread that can be formed into a specific shape can be used. Form them into soles of shoes. When the son of a prominent judge was still unable to walk at eight years of age, his mother brought the boy to the grave of St. Hedwig in her arms and was praying to St. Hedwig to heal him when, lo!, a miracle happened. In the presence of the priest who baptized him and the abbess of the monastery, the boy suddenly stood up, took an egg that lay before him and walked around the saint's grave. The abbess took other decorated eggs and threw them at the feet of the young boy, compelling him to walk further from the tomb. This miracle is said to have happened near Easter between 1274 and 1287 (p. 107, Polish Customs, Traditions, & Folklore by Sophie Hodorowicz Knab). Find out more about these Easter eggs, and try your hand at making these works of art. October is harvest time all over the world, but especially in Poland. Late September usually brings frost, so usually only the root crops, like cabbage, turnips, beets and carrots are remaining to be harvested. Old Polish legends talk about harvesting these late root crops and sowing of winter wheat on or just after October 15 which is St. Hedwig’s Day or Sw. Jadwiga in Poland. It is said that she sweetens these crops if they are left till then. See Polish Customs, Traditions, & Folklore by Sophie Hodorowicz Knab for more details. A self-effacing nun in the Visitation Convent at Paray-le-Monial, France, was inspired by the Lord Jesus to establish the devotion of the Holy Hour. Her name was St. Margaret Mary Alacoque, and from the age of seven, when she received her first Holy Communion, she had always manifested an intense love of the Most Blessed Sacrament. Our Lord appeared to her often, usually as the Crucified Christ. Her simplicity caused her to feel that these apparitions were also granted to others who had recourse to Jesus in the sacrament of His love. Once the Master appeared to the young girl as she was returning from a dance and reproached her for not espousing Him. When twenty-four years of age, Margaret entered the cloister, choosing the most menial tasks. Gifted with intelligence and common sense, she made great progress in holiness. Our Lord entrusted to her the mission of establishing the reign of the Sacred Heart among the children of men. Criticism did not hamper her zeal, and her charity toward her opponents won them over to the cause of the Master. In the first revelation of the Sacred Heart to the nun, Our Lord made known His burning desire to be loved by all men, and His design of manifesting to them His Sacred Heart with its treasures of mercy. Margaret Mary communicated Our Lord's wish that the faithful receive Holy Communion on the first Friday of each month and observe the Feast of the Sacred Heart on the Friday after the octave of Corpus Christi. After nineteen years in the convent, St. Margaret Mary died October 17, 1690. Many pilgrims to her tomb have sought and obtained favors. Through her apostolate of devotion to the Sacred Heart many sinners have repented and found grace with God. Patron: against polio; devotees of the Sacred Heart; loss of parents; polio patients. Symbols: nun in habit of the Order of the Visitation and holding a flaming heart; nun in habit of the Order of the Visitation and kneeling before Jesus exposing His heart to her; Sacred Heart; heart. Find out more about the Jansenist heresy. Read the Twelve Promises of the Sacred Heart of Jesus; Strive to fulfill the obligation for the Nine First Fridays. Find out more about the Enthronement of the Sacred Heart, and establish this practice in your home. A book to read on this is Enthronement of the Sacred Heart by Francis Larkin, SS.CC. Find out more information from Congregation of the Sacred Hearts Online. St. Gerard was born in southern Italy on April 6, 1726. His father died while Gerard was still young, forcing him to be apprenticed to a tailor. His frail health, quiet disposition, and gentle ways led him to being bullied by fellow workers and by his employers. He was refused admission to the Capuchin Order on account of his youth, so he lived for a time as a hermit. His great love for Jesus crucified caused him to lead a very ascetical lifestyle. Getting to know the Redemptorists, he applied to them but was initially rejected because of his poor health. On his insisting, however, he was reluctantly accepted and sent to the novitiate with a note saying: "I am sending you a useless lay brother." Gerard was professed in July 1752, and quickly disproved the prediction of his uselessness by his excellent service as porter, tailor, and sacristan. His prayerfulness and dedication began to be too great to overlook and so he gained a reputation for sanctity. This brought a large number of persons to him for guidance in the spiritual life. He readily responded, revealing a remarkable gift for sensing the deep interior reality of a person. Because of this genius, of his ability to bring relief to the sick, and of his care for women in childbirth, many miracles were attributed to him and he gained the nickname "The Wonderworker." His popularity eventually led to accusations of sexual misconduct, which he bore patiently until they were proven false. Patron: Childbirth; children; expectant mothers; falsely accused people; good confessions; lay brothers; motherhood; mothers; pregnant women; pro-life movement; unborn children. Read this longer life of St. Gerard here. If you live close to Trenton, NJ make a pilgrimage to the National Shrine of St. Gerard where an annual procession is held on his feast day or you can pay a virtual visit to the website. Marguerite d'Youville, the first native Canadian to be elevated to sainthood, was born October 15, 1701 at Varennes, Quebec. She was the eldest child born to Christophe Dufrost de Lajemmerais and Marie-Renée Gaultier. Her father died when she was seven years old leaving this family of six in great poverty. It was only through the influence of her great grandfather, Pierre Boucher, that she was enabled to study for two years at the Ursulines in Quebec. Upon her return home, she became an invaluable support to her mother and undertook the education of her brothers and sisters. She married François d'Youville in 1722 and the young couple made their home with his mother who made life miserable for her daughter-in-law. She soon came to realize that her husband had no interest in making a home life. His frequent absences and illegal liquor trading with the Indians caused her great suffering. She was pregnant with her sixth child when François became seriously ill. She faithfully cared for him until his death in 1730. By age 29, she had experienced desperate poverty and suffered the loss of her father and husband. Four of her six children had died in infancy. In all these suffering Marguerite grew in her belief of God's presence in her life and of his tender love for every human person. She, in turn, wanted to make known his compassionate love to all. She undertook many charitable works with complete trust in God, who she loved as a Father. She provided for the education of her two sons, who later became priests, and she welcomed a blind woman into her home. Marguerite was soon joined by three young women who shared her love and concern for the poor. On December 31, 1737, they consecrated themselves to God and promised to serve him in the person of the poor. Marguerite, without even realizing it, had become the foundress of the Sisters of Charity of Montreal, "Grey Nuns". Marguerite always fought for the rights of the poor and broke with the social conventions of her day. It was a daring move that made her the object of ridicule and taunts by her own relatives and neighbors. She persevered in caring for the poor despite many obstacles. She was in weakened health and mourning the death of one of her companions when a fire destroyed their home. This only served to deepen her commitment to the poor. On February 2, 1745, she and her two early companions pledged themselves to put everything in common in order to help a greater number of persons in need. Two years later, this "mother of the poor" as she was called, was asked to become director of the Charon Brothers Hospital in Montreal which was falling into ruin. She and her sisters rebuilt the hospital and cared for those in most desperate human misery. With the help of her sisters and their lay collaborators, Marguerite laid the foundation for service to the poor of a thousand faces. In 1765 a fire destroyed the hospital but nothing could destroy Marguerite's faith and courage. She asked her sisters and the poor who lived at the hospital, to recognize the hand of God in this disaster and to offer him praise. At the age of 64 she undertook the reconstruction of this shelter for those in need. Totally exhausted from a lifetime of self-giving, Marguerite died on December 23, 1771 and will always be remembered as a loving mother who served Jesus Christ in the poor. Marguerite was one woman, but this daughter of the Church had a vision of caring for the poor that has spread far and wide. Her sisters have served on almost every continent. Today, her mission is courageously carried on in a spirit of hope by the Sisters of Charity of Montreal, "Grey Nuns" and their sister communities: the Sisters of Charity of St. Hyacinthe, the Sisters of Charity at Ottawa, the Sisters of Charity of Quebec, the Grey Nuns of the Sacred Heart (Philadelphia) and the Grey Sisters of the Immaculate Conception (Pembroke).